Photo ID required. No charge. No appointment needed. 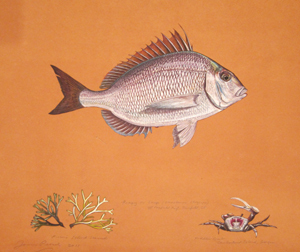 I am not painting fish to represent a species in a field guide; I am painting an individual fish that I had a personal experience with, that I saw in the water and on the deck of a boat, in all of its living colors, with its mirror sheen reflecting the world around it. I am part of my paintings—if I see my own reflection in the eye of the fish, or a bit of my turquoise windbreaker on the sides, I will paint that in—I see each one as a self-portrait. What’s in a name? Everything. That's because the way we name and impose order on nature shapes the way we perceive and treat it. If unnamed and unrecognized, animals and plants are ignored. They won’t be lobbied for under legislation such as the Endangered Species Act and could vanish before we even begin to understand the implications of their loss. Artist and naturalist James Prosek has spent his life observing and documenting nature. His work has been the subject of museum exhibitions at the Aldrich Contemporary Art Museum in Ridgefield, CT and the Nouveau Musee National, Monaco, among others. A major survey exhibition at the Addison Gallery of American Art is scheduled for 2013. He lives and works in rural Connecticut.